Integral Mechanical Attachment, highlights on one of the world’s oldest technologies and makes it new again. Think of buttons and toggles updated to innovative snaps, hooks, and interlocking industrial parts. Mechanical fasteners have been around as long as mankind, but manufacturers of late have been re-discovering their quick, efficient and fail proof advantages when using them as interlocking individual components as compared with such traditional means of joining materials like welding, soldering, gluing and using nuts bolts, rivets and other similar devices. For many years, it has been virtually impossible to find a single-source reference that provides an overview of the various categories of fastening systems and their various applications. Design engineers should find this book to be an invaluable source of detailed, illustrated information on how such fasteners work, and how they can save time and money. 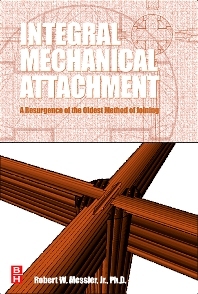 Students, too, will find this book to be extremely useful for courses in mechanical design, machine design, product development and other related areas where fastening and joining subjects are taught. This will be the first reference book to come along in many years that will fully illustrate the major classes of integral mechanical fasteners, replete with examples of typical assembly and ideas and suggestions for further research. Professional Engineers in Mechanical, Aerospace Engineering, and Civil Engineering, particularly those involved with designs for assembly of components and product manufacturing.